Product prices and availability are accurate as of 2019-04-21 06:14:03 EDT and are subject to change. Any price and availability information displayed on http://www.amazon.com/ at the time of purchase will apply to the purchase of this product. These sleeveless surgery bras give excellent control to recover after specific surgical procedures such as: mastopexy, breast augmentation or reduction. Use our Salome versatile piece daily and combine it with your favorite outfits. Made of Powernet, a magical fabric of an elastane and polyamide blend that will effectively compress and hold in your breast and high back. This bra post mastectomy has an inner hypoallergenic cotton lining to provide even more security and comfort to your skin. A v-neckline, high back coverage and front closure posture corrector, that is also gentle to your skin are just a few of the star features Salome's amazing surgery compression bra 0312. Sizes range from 32 to 42 (USE OUR SIZE SIZE CHART FROM THE PRODUCT IMAGES). Con nuestro suave sosten post operatorio luce ese vestido soñado con escote que tanto deseas, incluso mientras te recuperas. Nuesto Salome "Brasier Postquirurgico" está hecho de Powernet con cubierta interna de algodón para mayor comodidad. Un brasier postoperatorio para senos con escote en "V", cobertura de la espalda superior, broche frontal. Es además un fabuloso corrector de postura. Post-Surgical Bra 0312 with snaps, inside covered with cotton and hypo-allergenic fabric, externally covered in powernet. Perfect for everyday use or after surgery. This Post Surgery Bra is Made in Colombia. 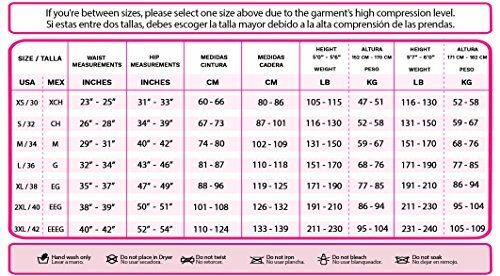 Also known as: Fajas Colombianas, Fajas Reductoras, Fajas para adelgazar, Fajas Postparto, Colombian Body Shaper, Post Surgical Bra or Shapewear. Please use the size chart in the images to select your size. For being a high compression garment, the size could vary from regular clothing. If you are between sizes, please size up. Brasier postquirœrgico con broches. Producto 100% producido en Colombia por lo que sus est‡ndares de calidad son los mas altos del mercado. Utiliza la tabla de medidas suministrada en las im‡genes para encontrar tu talla. Por ser prendas de alta compresi-n la talla puede ser diferente a la de ropa regular. Si estas indecisa entre tallas, escoge la m‡s grande.